[WSO2Con EU 2018 The Hybrid Integration Platform: Can You Be in Business Without One? The Hybrid Integration Platform: Can You Be in Business Without One? An "unintegrated digital business" is simply an oxymoron. Digitalization does empower organizations to innovate and disrupt, but entails tackling a daunting array of application, data, APIs, mobile apps, ecosystems and "things" integration issues. An enterprisewide hybrid integration platform to support these challenges is becoming a business utility such as networks, email and ERP: a precondition to be in business for organizations of any kind. Massimo Pezzini is a Vice President and Fellow in Gartner Research. His focus is currently on pervasive integration, integration architecture and infrastructure, hybrid integration platforms (HIP), integration PaaS and SaaS (iPaaS, iSaaS), API, in-memory computing (IMC) and hybrid transaction/analytical processing (HTAP). 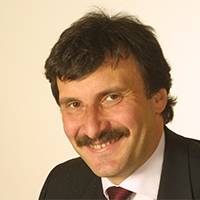 Currently Massimo is also Gartner Vendor Lead Analyst for SAP.